This picture is a couple of weeks old, but I decided to share it anyway. 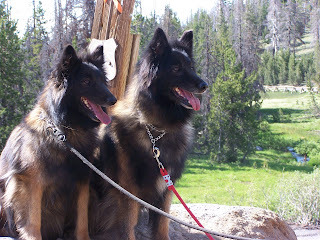 On the left is Osita and on the right, Kiani, our Belgian Tervuren dogs. The picture was taken up above Sisters, Oregon, in the Triple Creek Lake area, adjacent to the Sisters Wilderness Area. 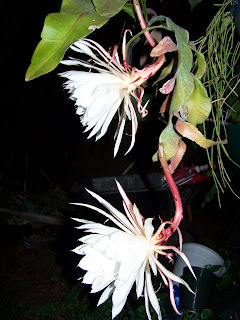 We recently had the pleasure of having two blooms on our Epiphyllum oxypetalum on the same night. Each flower is 8 inches across. I'm afraid I haven't been too diligent at posting lately. My apologies. It's been a bit chaotic. We now have a Paso Fino horse: Jardinera de Omega. She arrived from Florida about a week and a half ago and we've been spending some time out at the stables (a few miles from us) to get to know her. Last Sunday we took a day trip up into the mountains to Sister's Oregon and further on the Three Creek Lake up next to the Sisters Wilderness. Lucky for us, the van didn't blow it's engine until the next day. Searching for a new, used van now! And this coming weekend, July 17-19, I'll be at Portland Nursery (5050 SE Stark St. for those in the Portland area), where we will be participating in the Oregon Cactus & Succulent Society Summer Show and Sale. Hope to see some of you there. I can't go out to the nursery and start potting up plants for the sale until I post a new photo, this one of Huernia bayerii. Enjoy. Well, it's not quite the 4th, but 'Stars and Stripes' is setting off its fireworks in a spectacular manner. Who needs the kind which blow up and go bang when you have this?